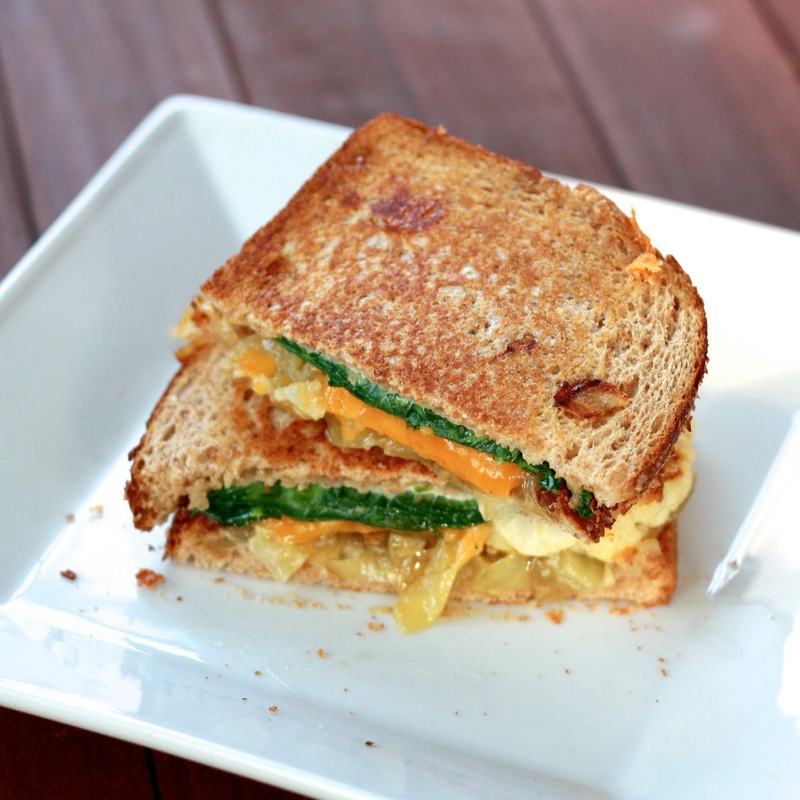 This might be the weirdest sandwich recipe I’ve ever posted on The Sweets Life. Perhaps you thought the portobello pineapple sandwiches with teriyaki ketchup were a little different or that the lentil burgers with tzatziki were a little strange, but cauliflower? On a sandwich? Have I lost my mind? Trust me on this one. I was a little skeptical too, but Daphne Oz’s convincing description in her book Relish convinced me to give it a go. I’m never one to turn down an odd-sounding combination and anything with caramelized onions is a win in my book. 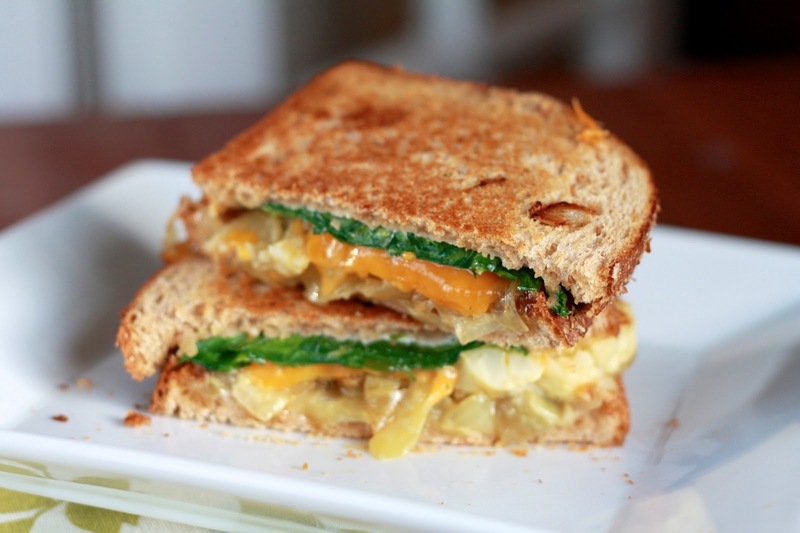 The sandwiches are made in a skillet, much like a grilled cheese, but the elements are completely unique: roasted cauliflower, shredded cheddar, and caramelized onions are sandwiches between two pieces of bread slathered with a jalapeno mayo. Random? Completely. But somehow, it all works together. I don’t even know how to describe this sandwich, except to say that Daphne Oz nailed it with this one and I was craving it for days after trying it the first time. I’m dying for others to make it and give me their take—please report back when you do! *makes 1 sandwich--double, triple, etc. as needed! 1. Preheat oven to 425F. In a medium sized pan, add the onion with 1 1/2 tbsp oil. Cook over medium-low heat, stirring frequently, until the onion is soft and caramelized (20-25 minutes). 2. Toss the cauliflower with the remaining 1 1/2 tbsp of oil. Sprinkle with salt and pepper, and lay the cauliflower flat on a baking sheet lined with foil. Roast for 10 minutes or until lightly browned. Flip the cauliflower and roast for an additional 5 minutes (don't burn). 3. Combine the aioli ingredients in a small bowl and mix well. Spread both slices of the bread with the aioli. Top one slice with caramelized onions, followed by the cauliflower, cheese, and arugula. Top with second slice of bread. 4. Add butter to the pan used to caramelize the onion and heat over medium-low, until butter is melted. Add the sandwich (slice closer to the cheese on the bottom) and cook for 4-6 minutes, until the bottom is golden and cheese begins to melt. Use your spatula to apply pressure to the top of the sandwich. Flip sandwich and cook the other side for 3-4 minutes. Slice sandwich and serve immediately.